At GSDC we are proud to support the Employment Capacity Building Cohort (St. Cloud ISD742) and WACOSA in helping prepare students and community members with disabilities for gainful employment in our community. A growing and thriving community considers all of its potential workforce – including often untapped community members who are eager and willing to be employed. For more information about how this program will benefit your company, contact me at gcruikshank@greaterstcloud.com or 320-257-4753. TEDxStCloud 2018 Earns Net Promoter Score of 79! = "Excellent/World Class"
TEDxStCloud 2018 received rave reviews, and we are especially proud of the Net Promoter Score generated by anonymous reviews by attendees: 79! But, what does that mean? "General NPS Benchmark. Given the NPS range of -100 to +100, a “positive” score or NPS above 0 is considered “good”, +50 is “Excellent,” and above 70 is considered “world class.” Based on global NPS standards, any score above 0 would be considered “good.”" Source. This experience was incredible! The speakers just kept getting better! this great event to St. Cloud! intend to continue as long as I'm around! I would like TEDx to continue in St Cloud. It was a great event! priceless. They spoke freely and openly and invited new perspectives. I have never attended a local event and seen such a diverse crowd. larger than St. Cloud. Great job!! Watch www.TedxStCloud.com for info about the 2019 event on October 10! Contact Sonja Gidlow at sgidlow@greaterstcloud.com for information about getting involved and/or being a sponsor in 2019. Posted on December 17, 2018 by GSDC User. As the holiday season approaches I find myself reflecting on all that has transpired throughout the year. At GSDC we are dedicated to supporting our investors – and our greater St. Cloud region - with services and resources that strengthen business growth and economic prosperity for all. While our founding strategic plan has served us well for the past seven years, our board of directors spent much of 2018 refreshing that plan to reflect our aspirations through 2024. The process included research, analysis, focus groups and your input. We appreciate the time you took to reflect and comment on our work. The final, approved version of our 2019 – 2024 Strategic Plan can be found here: Strategic Plan. We are in the process of aligning our resources with the new plan for 2019 – exciting, indeed! More on this to come in 2019. Similarly, our Board of Directors has some new faces, including Presidents Robbyn Wacker and Annesa Cheek of St. Cloud State University and St. Cloud Technical and Community College, respectively. Joining them is Willie Jett, superintendent of the St. Cloud Area School District and Caryl Turnow, executive director of the Central Minnesota Community Foundation. In order for our collective impact approach to economic development to be successful, we need thought-leaders from all sectors around the table. The willingness of these leaders to engage in our work demonstrates their understanding of and commitment to our region’s vitality – for the benefit of all. In terms of projects, services and partnerships that benefit our investors and the greater community, 2018 has been a productive and satisfying year. The highlights are many, including the SCSU Winter Institute, our GSDC Well-Being and Talent Summits and webinars, Quarterly Business Report, advancements in and increased utilization of www.GreaterStCloud.com (our regional portal), Select USA Foreign Direct Investment, business retention and expansion visits and assistance, responses to business attraction inquiries, downtown St. Cloud improvement initiative, St. Cloud Regional Airport economic impact and optimization study, our Innovation Awards, Tour of Manufacturing, skilled workers initiative, and TEDxStCloud – to name a few, but certainly not all. Granted – we’ve got a top-notch GSDC team, but none of this would be possible without the support and engagement of you – our investors and partners. We’re not a team that rests on our laurels, though – and plans are underway for many great things to come in 2019. On that note, be sure to save the date of April 11 – our annual meeting. It will be an evening Octennial celebration. Watch for invitations to come. In the meantime, on behalf of our GSDC Team, we wish you a safe and festive holiday season! Posted on November 12, 2018 by GSDC User. One of the 2019 – 2024 strategic priorities for the GSDC’s ‘Expand Talent’ imperative is to strengthen the interface of business and education to better meet talent needs in the region. And we’ve identified an excellent opportunity for putting that priority into action! Hour of Code is a world-wide movement that the St. Cloud Area School District 742 is participating in and taking it a step further by offering Community Code. Through community member engagement, the St. Cloud Area School District 742 strives to demystify technology by showing students how technology is powering innovation in Central MN. Students and the broader community are given hands on experience while exploring the power of computer science, starting in kindergarten, through this program. At the core of the Community Code program is community engagement. And who better to engage than you and your employees! This is an excellent opportunity to expose and engage with students and their parents to cultivate career path interests that are aligned with your company’s talent needs and opportunities. And, awareness of your company and its powerful brand in and commitment to our region are amplified through your company’s participation. Further information about the Community Code program can be found bit.ly/communitycode742. Angie Kalthoff, Technology Integrationist at ISD 742, is leading this wonderful effort and we encourage you to reach out to her to learn more about how you can get engaged in helping shape the hearts, minds and passions of our youth. Angie can be reached atangela.kalthoff@isd742.org or 320-370-8123. Many of the Community Code events will take place during Computer Science Education Week, December 3-9, 2018. As such, recruitment of community member volunteers needed to make this exciting program happen requires volunteers to sign up as soon as possible. We received the following good-news comment about the Professionals In Transition event we held earlier this year. The original blog is below. As much as our region is experiencing exceptional growth unfortunately we have also witnessed some consolidations, business sector changes and simply downsizing. The people impacted by these changes have established families and careers here. They have the desire to remain in our region. We WANT them to stay in our growing region. To this point, GSDC has created a model that has worked exceptionally well in connecting these talented employees with employers seeking their skill set. 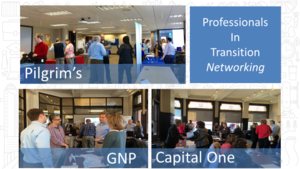 To date GSDC has hosted two events for Pilgrim’s (formerly GNP) and two events for Capital One. These events are an exclusive opportunity for GSDC Investors to meet and network with these individuals in hopes to secure a potential new career opportunity or obtain some helpful connections in their search for new employment. GSDC is very proud to coordinate these opportunities and will continue to do so as we are asked to help secure this top talent within our region. For more information about these networking events please contact Gail Cruikshank. Posted on May 1, 2018 by Gail Cruikshank.